For ordinary framed buildings there will be no difficulty in obtaining timbers large enough for every purpose, but in large structures, or in any building where heavy loads must be carried, it is often impossible to get a single piece which is strong enough to do the work. In this case it becomes necessary to use either a steel beam or a trussed girder of wood, or to build up a compound wood girder out of a number of single pieces, fastened together in such a way that they will act like a single piece. Steel beams are very often employed for girders when a single timber will not suffice, and although they are expensive, the saving in labor helps to offset the extra cost of the material. Wherever wood joists or girders come in contact with a steel beam they must be cut to fit against it. The steel shape most commonly employed is the I-beam and the wood members must be cut at the ends so as to fit between its flanges. This is shown in Fig. 222. The joist B is supported on the lower flange of the I-beam C and the strap A prevents it from falling away from the steel member. The strap is bolted or spiked to the wood beam and is bent over the top flange of the steel beam as shown. If two wood beams frame into the steel beam opposite each other, a straight strap may be used passing over the top of the steel beam and fastened to both the wood beams, thus holding them together. If a better support is desired for the end of the wood beam, an angle may be riveted to the web of the steel I-beam, as shown in Fig. 223, and the end of the wood joist may be supported on the angle. This is an expensive detail, however, and it is seldom necessary. If a timber is not strong enough to carry its load, and if it is not desirable to replace it with a steel beam, it may be strengthened by trussing. There are two methods of trussing beams: by the addition of compression members above the beam, and by the addition of tension members below it. The first method should be employed whenever, for any reason, it is desired that there be no projection below the bottom of the beam itself. The second method is the one most commonly used, especially in warehouses, stables, and other buildings where the appearance is not an important consideration. Fig. 222. Cutting Girders to Fit Steel Beams. Fig. 223. Fitting Girders to Steel Beams by Means of Angles. 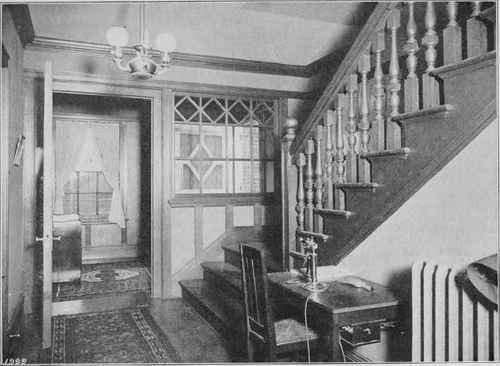 STAIR HALL IN RESIDENCE AT KENOSHA, WIS.
Pond & Pond, Architects, Chicago, Ill. For Plan and Exterior, See Vol. Ill, Page 314. In Fig. 224 is shown a beam which is trussed by the first method with compression pieces A above the beam. All the parts are of wood excepting the rods B, which may be of wrought iron or steel. The beam itself is best made in two parts E E placed side by side, as shown in the section at A. This section is taken on the line C D. The depth of the girder may be varied to suit the conditions of each case. In general the deeper it is made the stronger it becomes, provided that the joists are made sufficiently strong. Usually girders of this kind are made shallow enough so that the compression member will be contained in the thickness of the floor and will not project above it. A slight projection below the ceiling is not a serious disadvantage. The floor joists F may be supported on the pieces E, as shown at A. Fig. 224. Trussing a Girder by Use of Compression Members. Fig. 225. Trussing Girder by Use of Tension Member - King-Post Trussed Beam. Fig. 226. Trussed Girder with Two Struts - Queen-Post Trussed Beam. In Figs. 225 and 226 are shown examples of girders which are trussed by the second method with tension rods D below beam. These rods are of wrought iron or steel, and the struts A are of cast iron. The struts may be made of wood if they are short, or if the loads to be carried are not heavy. Sometimes the girders are made very shallow and the struts A are then merely wood blocks placed between the beams C and the rod D to keep them apart. The girder shown in Fig. 225 is known as a king-post trussed beam, while the one shown in Fig. 226, with two struts instead of one, is known as a queen-post trussed beam. The beam itself, C, may be made in two or three pieces side by side with the rods and the struts fitting in between them, or it may be a single piece, and the rods may be made in pairs, passing one on each side of the beam. The struts bear against the bottom of the beam, being fastened to it by bolts or spikes, as shown in the illustrations, so that they will not slip sidewise. It sometimes happens that a heavy girder is required in a situation where trussing can not be resorted to, and where steel beams can not be readily obtained. In this case the only resource is to build up a compound beam from two or more single pieces. A girder of this kind can be constructed without much difficulty, and can be so put together as to be able to carry from eighty to ninety per cent of the load which a solid piece of the same dimensions will bear. There are many ways of combining the single timbers to form compound beams, some of the most common of which will be described. Fig. 227. Construction of Compound Beam. The most simple combination is that shown in Fig. 227. The two single timbers are bolted together side by side, with sometimes a small space between them. The bolts should be spaced about 2 feet apart and staggered as shown, so that two will not come side by side. Usually bolts three-quarters of an inch in diameter are used. In Fig. 228 is shown a modification of this girder known as a "flitch-plate" girder. It has a plate of wrought iron or steel, inserted between the two timbers, and the whole is held firmly together by bolts. The size of the plate should be in proportion to the size of the timbers, so as to make the most economical combination. In general the thickness of the iron plate should be about one-twelfth of the combined thickness of the timbers. If we have two pieces of timber out of which we wish to make a compound girder, it is always possible to get a stronger combination by placing them one on top of the other, than by placing them side by side. This is because the strength of a beam varies as the square of its depth, but only directly as its width. For this reason most compound girders are composed of single pieces placed one above the other. The tendency is for each piece to bend independently, and for the two parts to slide by each other, as shown in Fig. 229. This tendency must be overcome and the parts so fastened together that they will act like a single piece. There are several methods in common use by which this object is accomplished. Fig. 230 shows the most common method of building up a compound girder. The timbers are placed together, as shown, and narrow strips of wood are nailed firmly to both parts. The strips are placed close against each other and have a slope of about forty-five degrees, sloping in opposite directions, however, on opposite sides of the girder. It has been claimed that a built-up girder of this kind has strength ninety-five per cent as great as the strength of a solid piece of the same size but it is very doubtful whether this is true in most cases. Actual tests seem to indicate that such girders have an efficiency of only about seventy-five per cent. They usually fail by the splitting of the side strips, or the pulling out and bending of the nails, but seldom by the breaking of the main pieces. It is, therefore, essential that the strips should be very securely nailed to each of the parts which make up the girder, and that they should also be carefully selected so that only those pieces which are free from all defects may be used. These girders are liable to considerable deflection, and should not be used in situations where such deflection would be harmful. Fig. 229. Action of Compound Girder Under Tension. Fig. 230. Method of Building up Compound Girder. In Fig. 231 is shown another form of girder with the parts notched, as shown, so as to lock together. This prevents them from slipping by each other. Bolts are employed to hold the parts together, so that the surfaces will always be in close contact. While this form of girder is very easily constructed, it has many disadvantages. A great deal of timber is wasted in cutting out the notches, as these must be deep enough to prevent crushing of the wood at the bearing surfaces, and thus the full strength of the timbers is not utilized. Moreover, it is apt to deflect a good deal, and its efficiency is not so great as that of other forms. On the whole it is inferior to the form previously described. The compound beam which is almost universally considered the best is that shown in Fig. 232. This is known as a keyed beam, its characteristic feature being the use of keys to keep the parts from sliding on each other. 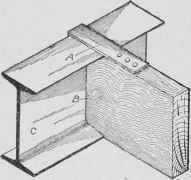 The strength of a keyed beam has been found by actual experiment to be nearly ninety-five per cent of the strength of the solid timber, while the deflection when oak keys were used was only about one-quarter more than the deflection of the solid beam. By using keys of cast iron instead of wood this excess of deflection in the built-up girder can be reduced to a very small percentage. The keys should be made in two parts, each shaped like a wedge, as explained in connection with the keys for tension splices, and should be driven from opposite sides into the holes made to receive them, so as to fit tightly. They should be spaced from 8 to 16 inches apart, center to center, according to the size of the timbers, and should be spaced more closely near the ends of the beam than near the middle. In the center of the span there should be left a space of 4 or 5 feet without any keys. Fig. 231. Compound Girder with Notched Surfaces. Fig. 232. Example of Keyed Beam.